Clicking on images provides larger ones. Marvel Comics Boxers are available from WebUndies.com. Characters include Spiderman, Captain America, The Thing, and more. Animation news -- and much more!!! The Continuum today concludes its five-part report on the recent Ghost Rider press event at the Hollywood Forever Cemetery with an interview with writer/director Mark Steven Johnson. For an edited transcription of a roundtable question-and-answer session, CLICK HERE. For an interview with Ghost Rider star Nicolas Cage, CLICK HERE. 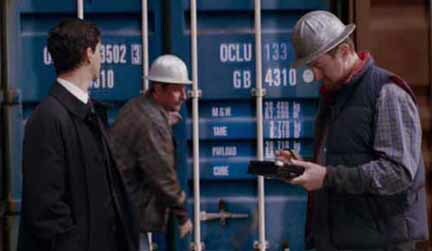 Ralph Winter, right, in Fantastic Four cameo. Producer Ralph Winter has extended his deal with 20th Century Fox, but will he be working with Marvel Studios again? Winter has produced five of the seven Marvel/Fox films, including X-Men, X2, X-Men: The Last Stand, Fantastic Four and Fantastic Four: Rise of the Silver Surfer. The next Marvel/Fox movie figures to be Wolverine, and it could be before the cameras as early as 2007. "It is definitely possible, since I will be around at Fox," Winter told The Continuum from Vancouver, where FF: Rise of the Silver Surfer is wrapping production. "But nothing has been discussed yet." Wolverine, which will also be produced by Lauren Shuler Donner and star Hugh Jackman, is out to directors now. A source told The Continuum a director could be named before the end of the year. Look for more from Winter about FF: Rise of the Silver Surfer soon here in The Continuum. For covers and four-page previews of upcoming Dark Horse Comics titles, CLICK HERE. Titles include The Escapists #6, Outer Orbit #1, Conan #35, Criminal Macabre: Two Red Eyes #1, Ghost in the Shell 1.5: Human-Error Processor #3, Hellgate: London #2 and Rex Mundi #3. For Marvel Comics First Looks for Dec. 13 titles, CLICK HERE. * Image Comics has released the second-printing cover for The Walking Dead #33. The issue will go on sale on Dec. 27. Click on the thumbnail for a larger image. In case you missed The Continuum's recent coverage, here are some links. Click on the date to get the day's full report. * Monday, December 4: IDW Publishing for March, Spider-Man movie, Painkiller Jane, Battlestar Galactica, The Simpsons, Image First Looks and DC First Looks. * Sunday, December 3: Ghost Rider's Nicolas Cage and Archie Comics First Looks. * Saturday, December 2: Ghost Rider press event and Smallville. * Friday, December 1: Ghost Rider press event, Marvel First Looks and Image First Looks. * Thursday, November 30: Marvel First Looks, Justice League Unlimited/The Batman DVDs, The Guardian Line First Looks and Stan Lee. * Wednesday, November 29: Mark Steven Johnson talks HBO's Preacher, Marvel First Looks, DC First Looks, Kyle Baker and Red Sonja. * Tuesday, November 28: Image First Looks, Painkiller Jane TV series, Batmobile Hot Wheel and Battlestar Galactica. * Monday, November 27: New Avengers, Mid-Ohio Marvel panel, Mid-Ohio The Guardian Line panel, Mid-Ohio Feedback panel and DC Comics First Looks. * Sunday, November 26: From Mid-Ohio-Con -- Ultimate X-Men's Yanick Paquette and Spider-Man's Sean McKeever. * Saturday, November 25: From Mid-Ohio-Con -- Michael Avon Oeming, Devil's Due's Family Guy and Adam Hughes. 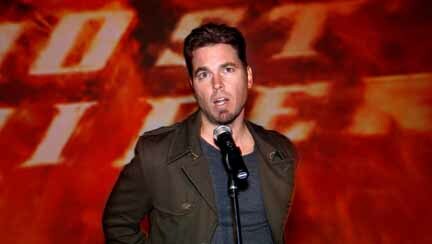 * Friday, November 24: Ghost Rider's Mark Steven Johnson, Archie First Looks and Yancy Butler. * Thursday, November 23: Spider-Man 3, Image Comics First Looks, Captain America: The End and Hellshock. * Wednesday, November 22: Spider-Man 3, Marvel Comics First Looks and Battlestar Galactica. * Tuesday, November 21: Heroes, First Looks, The Batman and Hunter-Killer. * Monday, November 20: Image Comics for February, Marvel First Looks, Mike Allred's Madman at Image, Fantastic Four: Rise of the Silver Surfer's Chris Evans, Smallville, David Wohl to write Se7en: Pride, Dynamite First Looks and DC First Looks. * Sunday, November 19: Sarah Douglas talks Donner's Superman II, First Looks and Battlestar Galactica. * Saturday, November 18: Top Cow for February, Bluewater First Looks, Battlestar Galactica and Dynamite sell-outs. * Friday, November 17: October sales, Steve Epting talks Captain America, The Batman, First Look, Marvel press conference: Monte Cook and Magician: Apprentice. * Thursday, November 16: Devil's Due Publishing for February, Action Comics #844 second printing, Legion of Super Heroes and First Looks. * Wednesday, November 15: Marvel Comics' Civil War one-shots, Marvel First Looks, new Nexus and The Moth and Image First Looks. * Tuesday, November 14: Marvel Comics for February, Boom! Studios for February, Aspen Comics for April, Devil's Due to publish Chucky comics, Nicolas Cage at Virgin Comics and Marvel First Looks. * Monday, November 13: DC Comics for February, Spider-Man: Back in Black, Marvel's February Civil War titles, Archie Comics for February, Heroes, Moonstone Books for March and Invincible Iron Man DVD. * Sunday, November 12: Ghost Rider movie, DC Comics and Battlestar Galactica. * Saturday, November 11: From Wizard World Texas: Ghost Rider movie, DC Comics and Top Cow, and The Simpsons. * Friday, November 10: Aspen Comics at Wizard World Texas, Greg Horn on Ms. Marvel, Jeph Loeb on Buffy the Vampire Slayer, Legion of Super Heroes animation and First Looks. * Thursday, November 9: Spider-Man 3 trailer, IDW Publishing for February, Claypool Comics for February, Image First Looks, Marvel First Looks and Incredible Hulk.